Some say “Diamonds are a girl’s best friend” but in my case it is not the diamonds that make me shine but the handbag that I am carrying. There are so many to choose from so do you opt for a modern designer Gucci or a vintage 50s Llewellyn. The choice is entirely up to you but I do know that if you are holding a vintage bag you will definitely stand out from the crowd. Bags date as far back to when they were made of skin and used as a container for food and flints but from these extremely humble beginnings have progressed to become must-have fashion accessories that every woman adores. Handbags became an important part of status and substance in the early part of the 19th century but it is the innovative and colourful designs of the 20th century that made these items what they are today. The Metal Mesh Bags were introduction towards the end of the 19th century but really came into their own in the 1920s as the perfect accessory for the “Flapper” girl. These bags had screen printed brightly coloured designs and the most well known are bags by American company “Whiting and Davis” which are all signed on the clasps; they reach as much as £150 on the secondary market today. Another well known and sought after designer of mesh bags in the 1930s was Mandalian, a Turkish designer who lived in the USA. The influence for his designs came from the patterns that you find on Turkish rugs and so are always brightly coloured, expect to pay £120 to £150 for a Mandalian design. Mesh bags made a revival in the 1950s but this particular decade became the most innovative for handbag design. Introducing new materials such as Lucite, the new box bags were popular, fun and modern. American designers such as Llewellyn and Willardy are the epiphany of 1950s design and so are always highly sought after by collectors. 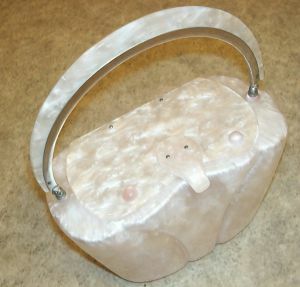 One of the rarest handbags from this decade has to be the “Beehive” by Llewellyn in 1951. 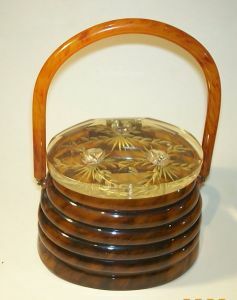 It has a beehive shaped base with carved lid which has gilded metal bees on top, there are many beehive variations of this particular handbag but this is the original, thus commanding as much as £200 to £300 if you manage get your hands on one. 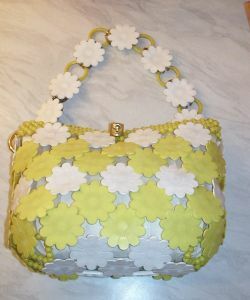 Other popular bags in the fifties were made of raffia or wood, all highly decorated with beads, shells, or sequins and the Poodle motif was extremely popular. Post war design in bags became quirky with matching clip on umbrellas and even a battery operated light that enabled ladies to see into their bags even during the darkest of evenings. 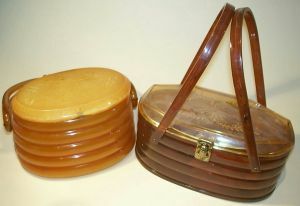 Pictured: Plastic American beehive style bags 1950s – £40 each/$70 each. Moving into the swinging Sixties plastic bags became all the range, the material PVC typified the era heavily influenced by Pop art and Op Art. Clothes designers such as Mary Quant and Biba opened their fashion boutiques and it became essential to team a dress and shoes up with a matching handbag, known as the “Total Look”. The daisy was also a popular design as it was the Quant logo and hard plastic bags appeared with all kind of daisy designs in different guises. Italian designer, Emilio Pucci, appealed to the wealthier woman of this decade with his psychedelic patterns and although he is better known for his clothes design he also produced some wonderful ladies handbags in the same swirly, kaleidoscope of colourful material but these do have a premium price attached. However, there is no need to part with large amounts of money to purchase handbags with psychedelic designs as the hippy generation towards the end of the sixties were particularly associated with this pattern and good examples can be found for as little at £50 to £80. Handbags are a woman’s must have accessory and with so much choice it is difficult to make a decision. Look for good makers names, innovative designs and shapes that ensure individuality. The most enticing thing about buying vintage bags are that these items are useable and instead of just admiring them in a cabinet use them and I guarantee you someone will want to know where you bought that bag? Smell inside a Lucite 50’s bag before buying, if there is a strong chemical smell do not buy because this means that it is in the process of deteriorating. Store Lucite bags away from direct sunlight and extreme heat. Shortage of leather after WW2 forced manufacturers such as Gucci to use cane handles on bags. Look for original labels and makers marks. All well made designer handbags are signed. The more innovative the design the more sought after the bag. Check for cracks and faults especially on Lucite bags. Watch out for fake designer such as “2.55” Chanel bag, the market in the 1980s and 1990s were flooded with copies of this design. The Bolide Bag in 1923 was the first bag in history to feature a zipper.